Getty Images/PoolGary Cohn, the director of the National Economic Council. Gary Cohn, President Donald Trump’s top economic adviser, was asked about bitcoin in an interview on Friday. He simply shrugged. Cohn also addressed outstanding concerns about the Republican tax bill. 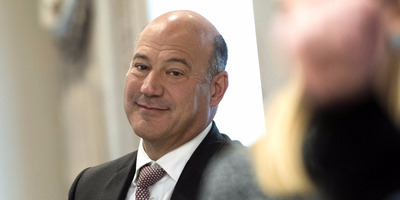 Gary Cohn isn’t quite sure what to make of bitcoin. CNBC’s Jim Cramer on Friday asked the National Economic Council director and adviser to President Donald Trump for his opinion on the cryptocurrency that has recently seen its price skyrocket. In response, Cohn simply shrugged. In an interview later on Bloomberg TV, Cohn said the Trump administration was keeping an eye on bitcoin and its “evolving market.” But he said the recent surge in price was not a significant economic threat. Bitcoin has experienced a week of wild gains, surging in value by more than $US5,000 a coin. Its price fell sharply on Friday,diving below $US15,000. In a press briefing last week, the White House press secretary, Sarah Huckabee Sanders, said bitcoin was something that Tom Bossert, the president’s homeland security adviser, was keeping an eye on. “I know this is something that is being monitored by our team here,” she said. In addition to his comments on bitcoin, Cohn said the Republican tax bill was also evolving. The bill, named the Tax Cuts and Jobs Act, is heading to a conference committee to resolve differences between the House and Senate versions. Cohn told CNBC and Bloomberg that the conference would address the state and local tax deduction, which is taken primarily in a handful of high-tax states, like California, New York, and New Jersey. Republican lawmakers from those states are concerned about a compromise that would allow people to continue to deduct up to $US10,000 in property taxes, but not state and local income tax or sales tax. Cohn said the White House was open to a compromise that would allow people to deduct $US10,000 in either property taxes or income taxes.